Bunratty Castle in County Clare is one of the most spacious castles of Ireland, with an extremely large Great Hall and plenty of space to show off wealth. 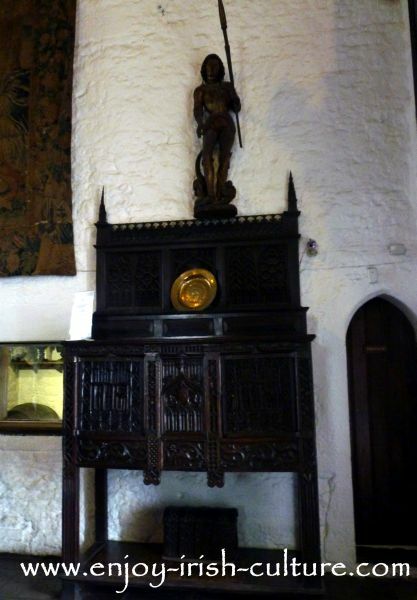 The important medieval and early Renaissance furniture collection accumulated by Lord and Lady Gort to furnish Bunratty Castle does indeed give a feel of medieval splendour as you can see in the photos above and below. Most everybody back then lived in dire poverty in huts or cabins without windows or doors, and when you imagine the ordinary person of the time looking at Bunratty Castle, they would have been truly blown away. Every medieval Irish castle was, first and foremost, built as a fortress. Bunratty features all the common medieval defensive features of the tower house; a raised entrance door to make attacks more difficult, a murdering hole above the main door, loop windows for optimal use of bow and arrow, battlements to aid the defence from roof level, see the battlements on the photo below. On top of that, Bunratty Castle, which was only accessible via a narrow passage way through the bog, and was surrounded by water from the river Raite, featured a draw bridge which could cut off intruders before they came anywhere near. Typically in Irish medieval castles, the basement, which was built as a strong stone vault, was used for storage, and sometimes to house animals, for example in times of danger. 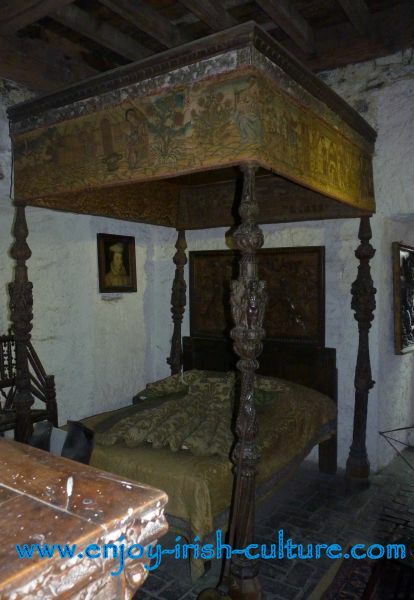 Bunratty of course had an exceptionally large basement, which was used to fulfil other, darker functions. There was a heavily guarded prison, not tall enough for prisoners to stand up in, but locked behind three doors. We are led to believe that the treatment of medieval prisoners wasn’t exactly very kind. As well as this prison however, the basement of Bunratty Castle holds an unequalled nasty secret den, one that unwanted visitors could be dropped into through a trap door in the floor above, to die being impaled on sharp spikes. What a lovely Irish welcome! 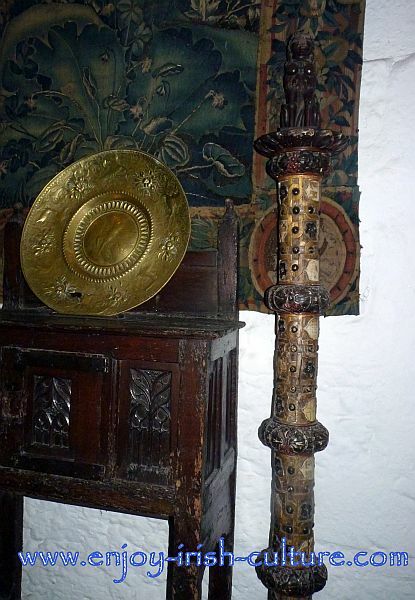 All the while the medieval powers that be at Bunratty considered themselves deeply religious. Or rather, I think, it was important for them to demonstrate to the world that the popular religion was on their side and supported them in their position of being the local ruler. As simple as that. 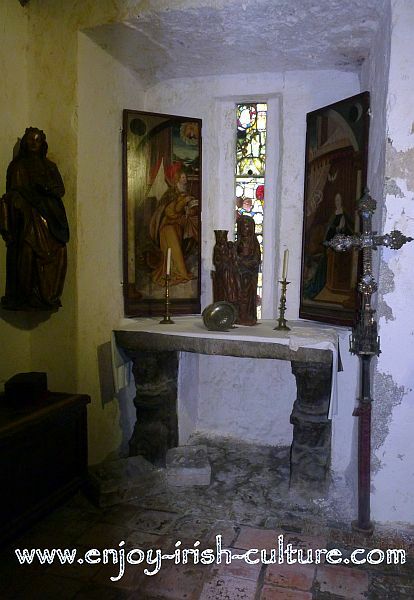 The castle featured two chapels, one private and one public, see one of them on the photo above. A priest was housed at the castle also, in luxurious accommodation that you can see below. This was one of the few medieval Irish castles that had a designated kitchen area, the Earls kitchen, see it on the photo below. Most cooking for large banquets however was done outside, in large leather pouches or bags suspended over an open fire. The fireplace in the kitchen was important for warming up those dishes as they arrived inside, before serving them. 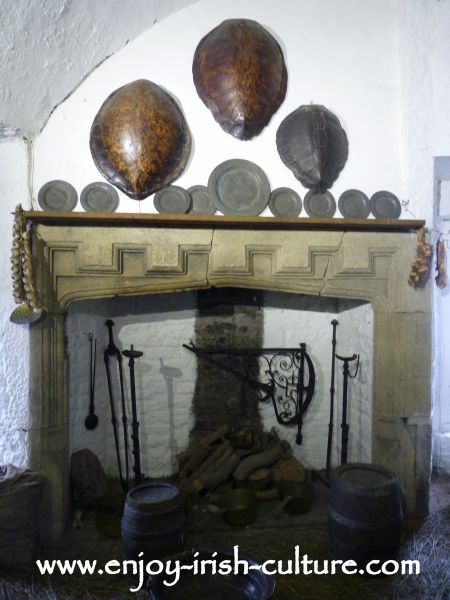 It was probably also used to prepare meals for a smaller number of people when the castle did not have visitors. Note the tortoise shells on the photo below. They were a medieval status symbol, showing the world how far you had travelled and how much money you had to spend as they didn't come cheaply. The reason the tortoise shells are keptin the kitchen? Sometimes they were used as serving bowls at banquets at this Irish castle. 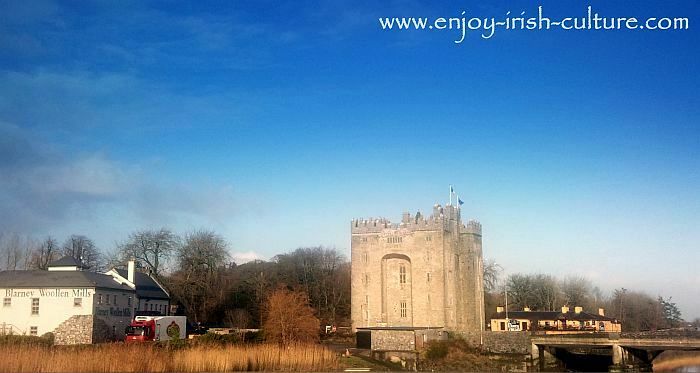 Read here about the fascinating bloody history of Bunratty Castle. 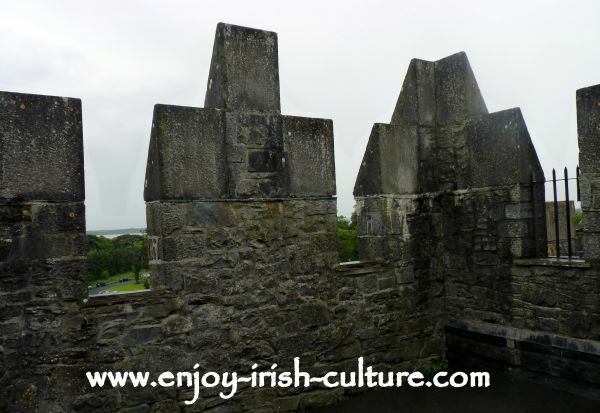 Find out tourist information about Bunratty Castle here including our review and special tips. Do you like what you see on this website? We sure hope you do as it's a labour of love for us. If you do, why not tell all your friends about this website so that they, too can enjoy the content we provide! There are some easy to use social options both at the top left and at the bottom. Just pick the one you like! Thanks a million! Warmest regards from Susanna and Colm.